Prior to the Information Age, technology innovation was localized and linear. Interconnected technologies have changed the way people work, think and act. Today, we live and work within an environment that is Exponential and Global. The aggressive growth of computing creates opportunity to develop advanced technologies that improve the world’s standard of living. With these advances, the growth demand for advanced packaging is exponential as well. Two critical drivers are high yields and reliability over the expected life of the device. The rapid adoption of high tech devices forces the electronics industry to continually develop smaller, faster and more reliable devices, especially mobile and hand-held devices. The mainstream features of electronic products are moving toward lighter, thinner, higher powered devices with more functionality. The new generation of CSP (Chip Scale Package), Flip Chip package, WLCSP (Wafer Level CSP), 3D IC (3-Dimensional Package) have been gradually replacing conventional packaging such as QFP (Quad Flat Packaging), DIP (Dual Inline Package) or SOP (Small Outline Package)…etc. KYZEN is on the cutting edge of developing advanced technology in fine pitch packaging which will result in better control of the low standoff gap height resulting in increased reliability and higher functionality of the circuit board assembly. Smaller form factors reduce pitch and line spacing between conductors. Flux residue, as well as other sources of ionic contamination can result in device failures. Cleanliness after packaging has become more important to ensure product reliability. The aggressive growth of computing creates opportunity to develop advanced technologies that improve the world’s standard of living. Back end wafer bumping requires a flux compound to join the solder bump to the metallized pads. Cleaning flux residues following the bumping process is commonly done in immersion and spray-in-air cleaning tools. Soldered interconnections typically require cleaning to improve downstream yields and reliability. Cleaning these devices is no easy task. 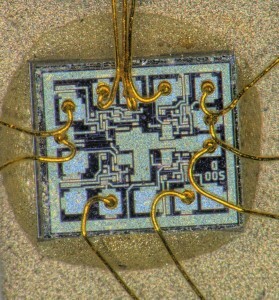 Some devices have thousands of interconnections with pitches as low as 75µm and Z-Axis as low as 15µm.